Astrophonica — the forward-thinking label launched by Fracture and Neptune in 2009— has announced its first compilation LP, 'Gradients'. Originally a platform for its founders' mad, break-laden beats, Astrophonica has sinced expanded to offer consistently impressive drum & bass and juke efforts from the likes of Moresounds, Sam Binga, Sully and Tehbis and Touchy Subject. The new 'Gradients' compilation brings all the aforementioned back into the fold, plus introduces the likes of dBridge, Teklife's DJ Earl, Stray, Om Unit's Philip D Kick alias and up-and-comers, Lewis James and Tusais. You can pre-order the LP ahead of its 24th March release here. 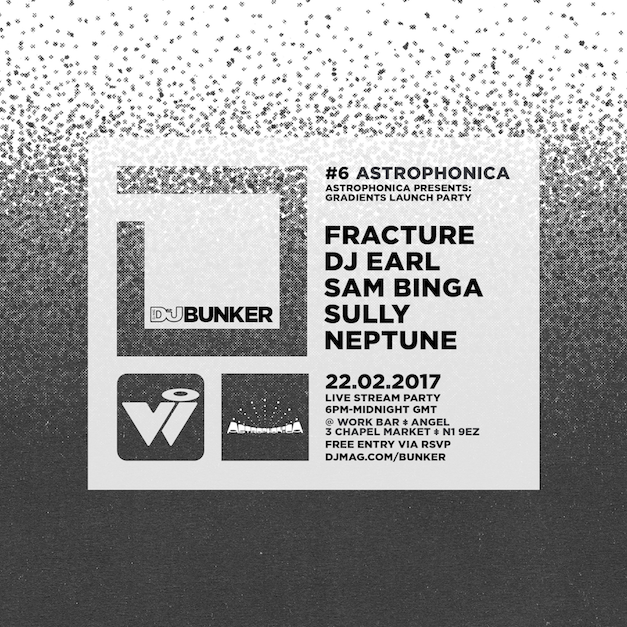 To celebrate Fracture has rounded up the troops for a special DJ Mag Bunker live stream launch party at Work Bar in Angel, London on Wednesday 22nd February. Alongside the bossman, Neptune will be making a grand return to play an 'Astrophonica Influences' set, DJ Earl is over from Chicago with a fresh arsenal of footwork bombs, plus Critical favourite Sam Binga and reborn junglist Sully will both bring their trademark sounds to the table. To come down and join the party, sign up to the guestlist here and let your friends know via the Facebook event. Or if you can't make it down, check out all the action via the live stream. In the meantime, check out this killer LP offering from Fracture and DJ Earl!